Malaysia Airlines (MAS) and Thai Airways are planning to increase capacity on European routes as they take delivery of the remaining A380s from their six-aircraft orders. Both carriers have opted against implementing original plans for deploying any of their initial A380s to Australia. MAS took delivery of its first A380s in May-2012 and Thai in Sep-2012. MAS now operates one daily A380 flight to London Heathrow and will use additional A380s to introduce a second daily Kuala Lumpur-Heathrow frequency and a daily Kuala Lumpur-Paris flight. Thai so far has only operated regional routes with its A380 but will soon begin using the aircraft for Bangkok-Frankfurt, followed by Bangkok-Paris. Thai at this point has no intention of following MAS in using the A380 for London. Thai Airways EVP commercial Pandit Chanapai told CAPA at the Association of Asia Pacific Airlines Assembly of Presidents in Kuala Lumpur on 09-Nov-2012 that placing the A380 on Bangkok-London would represent too big of a jump in capacity. He pointed out that the carrier currently serves the route with Airbus A340-600s, which Thai configures with only 267 seats, and that the carrier prefers to maintain two daily frequencies on the route with relatively small capacity aircraft. Thai earlier this year unveiled plans to make Bangkok-Frankfurt its first long-haul A380 route, with daily service beginning 15-Dec-2012. Thai is currently only operating the A380 from Bangkok to Hong Kong and Singapore. The carrier just took delivery of its second A380, making it possible to begin long-haul operations. Mr Chanapai says Thai aims to begin the second of its previously identified long-haul A380 routes, Bangkok-Paris, in Mar-2013, after the carrier receives its fourth A380. Thai also plans to begin Bangkok-Tokyo Narita A380 service on 16-Jan-2013, after taking its third A380. Mr Chanapai says Tokyo and possibly Hong Kong A380 services will continue after Paris commences but the Singapore A380 flight will not remain in Thai’s schedule. MAS will join Thai in launching A380 services at Paris CDG in Mar-2013. MAS commercial director Hugh Dunleavy said during a press conference at the AAPA Assembly of Presidents that the carrier will upgrade its daily Kuala Lumpur-Paris flight after receiving its fifth A380 in early 2013. MAS plans to upgrade its second daily Heathrow flight on 24-Nov-2012, following delivery of the third aircraft. Paris will be the only destination featuring A380s from three Southeast Asian carriers as Singapore Airlines already uses A380s for its only daily flight to Paris. Air France also operates the A380 on some of its Paris-Singapore flights. As a result, the decision by MAS and Thai to deploy the A380 to Paris could be seen partially as a competitive response in the broader Southeast Asia-France market. MAS is now the fifth largest carrier in the Southeast Asia-France market but will become the third largest after it upgrades its Paris service to the A380. Air France is the largest carrier in the market, followed by Thai. Air France now operates 17 weekly flights to Southeast Asia, including three weekly A380 flights to Singapore, four weekly 777-300ERs flights to Singapore, five weekly 777-300ER flights to Bangkok and five weekly 777-200 flights to Ho Chi Minh. Three of Air France’s Paris-Ho Chi Minh flights continue onto Phnom Penh in Cambodia. 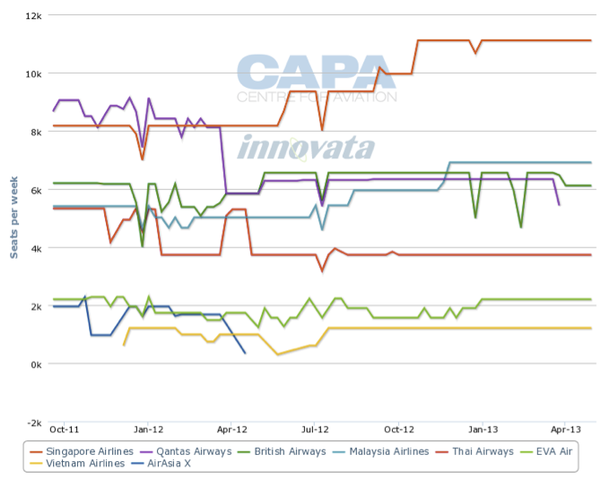 In the larger Southeast Asia-UK market, MAS also will move up two spots, overtaking Qantas and British Airways, after it upgrades its second daily London flight to the A380. 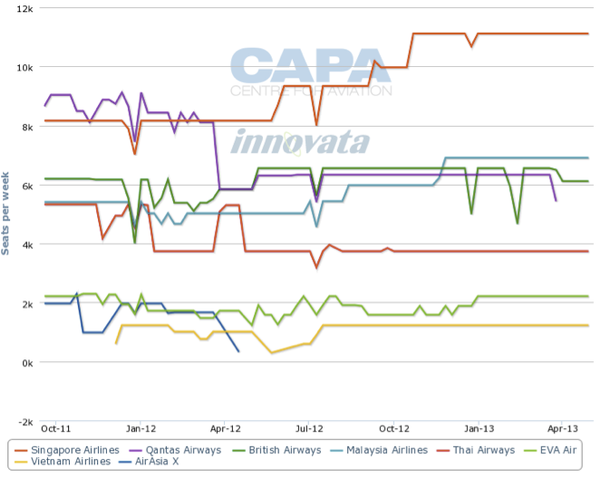 MAS is currently the fourth largest carrier in the Southeast Asia-UK market behind SIA, Qantas and British Airways. Unlike Thai, MAS currently does not face any direct competition in the Kuala Lumpur-London market as Malaysian long-haul low-cost carrier AirAsia X dropped its Kuala Lumpur-London Gatwick service earlier this year. (But British Airways is reportedly mulling service to Kuala Lumpur.) Mr Dunleavy says the AirAsia X withdrawal did not factor in MAS’ A380 deployment decision, explaining that the Gatwick market is very different to the Heathrow market. Offering a standard product on both London flights, particularly for premium passengers, was one of the main drivers in deciding to upgrade both frequencies to the A380. Mr Dunleavy also pointed out that Heathrow is a oneworld hub. MAS is slated to formally enter oneworld on 01-Feb-2013. KLM is now MAS’ main European partner and MAS’ Kuala Lumpur-Amsterdam service had previously been considered for the A380. The decision to go with London indicates a potential closer partnership with BA on flights within Europe and potentially beyond. MAS currently does not have any codeshares beyond Europe to North America and relies on interline agreements following its pull-down from North America (Newark was cut while Los Angeles was reduced). MAS would be interested in partnering with BA and its joint venture partner American on the trans-Atlantic. But it is unclear if there will be a mechanism for joining the existing BA-American partnership given that MAS does not operate on the trans-Atlantic. The existing tie-up between BA and American involves anti-trust immunity with metal neutrality. Frankfurt is a logical A380 route for Thai but not MAS as it is a hub for Star Alliance member Lufthansa. Germany is also a larger inbound market than the UK for Thailand. Thai is already the largest carrier in the broader Southeast Asia-Germany market. Thai’s second daily Frankfurt flight could be a candidate for the A380 after the carrier receives its final two aircraft in 4Q2013. Thai currently operates 11 weekly flights to Frankfurt with seven frequencies operated using 777-300s and four frequencies using 747-400s, according to Innovata data. But during peak periods Thai offers up to 14 weekly flights. After the A380 daily flight is introduced on the route, Thai will continue to also offer five weekly 777-300 flights to Frankfurt as well as two weekly 747-400 flights during peak weeks. Offering a standard A380 product across both Frankfurt flights, as MAS has chosen to do with London, is logical. With Paris, both Thai and MAS will only offer one daily A380 flight so this is not an issue. Thai currently operates to Paris with 10 weekly flights but schedules in Innovata show that the carrier will stop operating the extra three weekly 777 flights when the daily A380 service is introduced. Thai will likely wait a few months to assess market conditions in Europe before selecting a third long-haul flight for its A380 fleet. Mr Chanapai says the carrier’s fifth and sixth A380 are now slated for delivery in Oct-2013. Thai could end up considering Australia for these aircraft although this is not a certainty. Thai’s former CEO Piyasvasti Amranand told CAPA at last year’s AAPA Assembly of Presidents that the carrier would initially use its A380s to serve Frankfurt, London and Sydney. But with Paris instead selected in the end it is unclear which way Thai will end up going with its final batch of aircraft. London or Sydney will be reconsidered but Thai could also opt to upgrade its second daily Frankfurt flight or select another city altogether. MAS also originally planned to upgrade one of its Sydney and Melbourne flights to the A380. But Mr Dunleavy said MAS decided against this original plan partially because of limitations under the Australia-Malaysia bilateral. He explains that there is no more room under the existing bilateral for seat capacity expansion. MAS could opt to reduce frequency and bring in the A380 but prefers to maintain its current double daily service on Melbourne and Sydney. Mr Dunleavy said there was an attempt by Malaysia to re-negotiate the bilateral but “that didn’t work out too well”. A re-negotiation seems inevitable given AirAsia X's significant expansion hopes for Australia. MAS currently serves Melbourne with two daily A330-300 flights while Sydney is served with one 777-200 flight and one 747-400 flight, according to Innovata data. 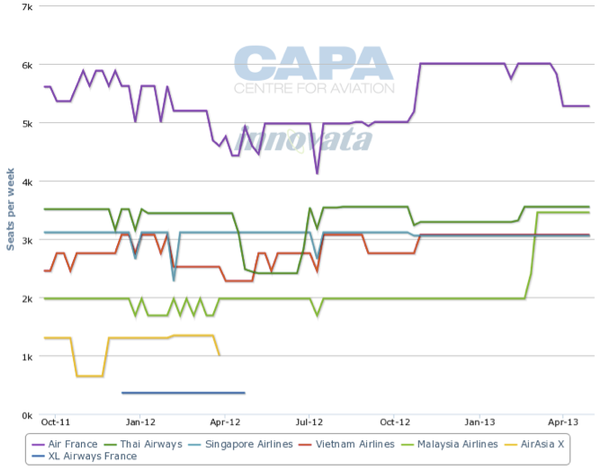 MAS will need to reduce capacity slightly to Sydney in 2013 because the carrier plans to phase out its last 747-400 after it takes delivery of its last A380. MAS is also now less likely to partner with Qantas on Australia-Malaysia flights, making higher capacity aircraft less attractive. Qantas is still sponsoring MAS entry into oneworld but discussions about a possible joint venture in the broader Asia-Pacific market, which would have covered Australia-Malaysia flights and regional Malaysia-Asia flights, fell through earlier this year. There have been no partnership talks in recent months between MAS and Qantas, signalling that the carriers at least for now have decided to go their separate ways. MAS still has to decide on a market for its sixth and final A380 but unless there is a large change in the bilateral and market conditions, the aircraft will not be deployed to Australia. Mr Dunleavy said the carrier will receive its sixth and final A380 in 2Q2013 but MAS will only operate a fleet of five A380s for an extended period as the entire fleet will have to be returned to Airbus for wing repairs. He says MAS has over one year to decide on a deployment for the A380. The decision by MAS and Thai against using the A380 to Australia at least for now also is a reflection of the broader Australia-Europe market. The kangaroo route has become increasingly competitive in recent years as Gulf carriers and mainland Chinese carriers have expanded their operations to Australia. Singapore Airlines still deploys its A380s on several of its Australia flights but it has a much larger network in Europe to feed its Australia flights. 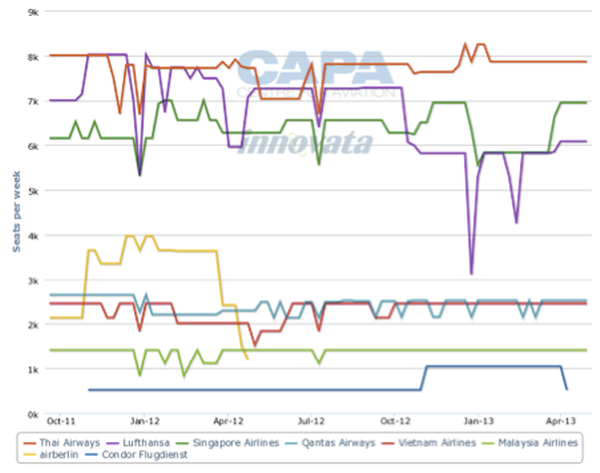 SIA is also the largest carrier in the broader Southeast Asia-Australia market. SIA will be left as the only A380 operator in the Southeast Asia-Australia market in Mar-2013, when Qantas redeploys its two A380 Singapore services to Dubai as part of its new partnership with Emirates. With MAS and Thai focusing their A380 operations more on Europe, the Southeast-Australia market may not receive a second A380 operator after Qantas withdraws. The A380s are widely considered to be too large for Thai and MAS, particularly given the tough market conditions in Europe. But the carriers are making the most of the aircraft and the publicity that comes with operating A380s. Although conditions in the London market are not ideal, Mr Dunleavy says MAS is so far pleased with its performance on its one A380 flight across all three classes of service. Kuala Lumpur-London is a flagship route for MAS and Paris is also a high profile destination. As a result MAS has a lot to gain from using the A380s on these routes rather than down-gauge to 777s as its 747s are retired. Thai also has a lot to gain from operating the A380 in Europe, an important market for Thailand’s tourism industry even in these tough economic times. However it remains to be seen whether having a sub-fleet of only six super jumbo aircraft can be profitable over the long-run.